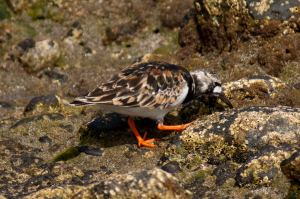 Observation - Turnstone Summer and Winter - Global. Description: I recently submitted a picture of a Turnstone in winter plumage taken at Portishead on 5th January 2010. There were some comments made regarding the difference between winter and summer plumages so I thought it might be useful to post both for comparison. I recently submitted a picture of a Turnstone in winter plumage taken at Portishead on 5th January 2010. There were some comments made regarding the difference between winter and summer plumages so I thought it might be useful to post both for comparison. The summer photo taken at Los Cristianos in Tenerife on 24th June 2009 shows the rich red-brown and black upper colouring and the change in head colouring to black and white.